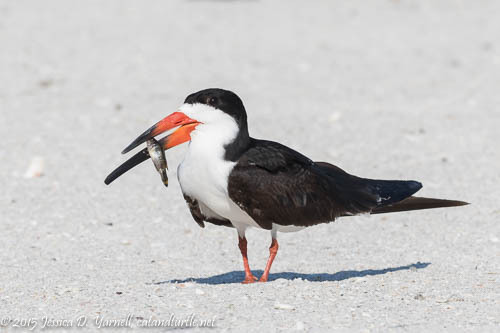 Last weekend I made my first visit of the year to the Black Skimmer colony on Florida’s west coast. 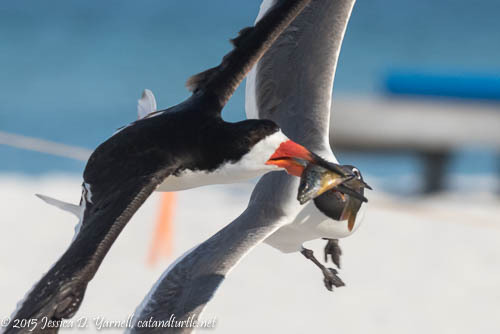 The skimmers return to the same patch of beach year after year in order to raise their young. 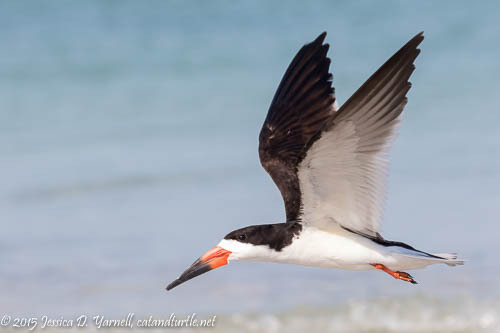 I began my morning at the ocean’s edge, photographing the skimmers as they went fishing for breakfast. People stopped to ask me the name of the bird that was skimming along the surface of the water. It’s not always easy to make a good photograph, as the birds move quickly, sometimes erratically, and the camera has a nasty habit of trying to focus on the water instead of the bird! …and after she takes the fish, she steps aside and lets him climb on her back for a brief piggy-back ride! Baby Skimmers On the Way! 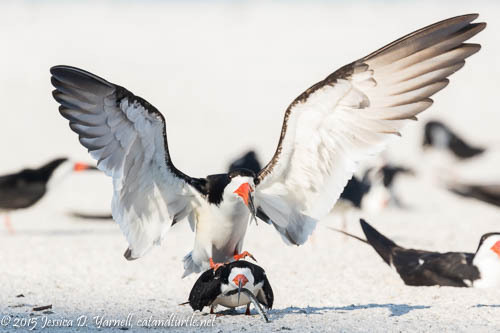 The skimmers are less cooperative than some of the terns when it comes to photographing the piggy-back rides. Terns will stand there for a good half minute and give you plenty of opportunities to get on a good angle and focus. With the skimmers, if you aren’t focused on the couple when they exchange the fish, forget it. The guy hops off really fast!! Suddenly there was quite the commotion as a trio of gulls flew after a skimmer with a particularly large fish. Around and around they went, with the gulls trying to grab the fish from the skimmer. The skimmer seemed to realize that he couldn’t out-fly them. So he flew outside the colony and dropped the fish. This poor little skimmer had a fish, but no one to give it to! He wandered around the back of the colony for about 5-10 minutes, showing off his fish and begging for a nice lady to pay attention to him. I don’t think one ever did. So he ate the fish himself. Let’s hope that there are no tropical storms in the next few weeks, and then we should start seeing the first babies hatch at this fun colony! I can’t wait! Superb series on one of my favorite birds!